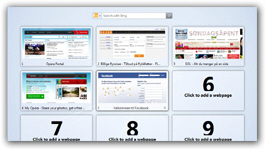 One of Opera's innovation on the web browser front is the "Speed Dial", which allows you to quickly access your favorite websites with a click (or a corresponding keyboard shortcut of Ctrl+1 through Ctrl+9 for the first nine websites / thumbnails you have added). But Opera even lets you customize the number of cells (rows and columns) you have on your speed dial: you can either pick from a pre-selection of combinations, or create your own speed dial arrangement - we will explain both methods in this tutorial. 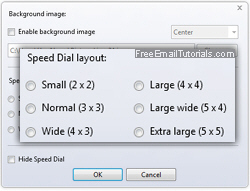 Opera will open the speed dial configurator popup, which offers choices of speed dial configuration: "Small", "Normal", "Wide", "Large", "Large wide", and "Extra large" - with the number of columns and rows indicated between parentheses, respectively. To apply a new set of rows and columns to your Opera speed dial, make your selection and click on the "OK" button to apply it right away (Opera will of course remember this setting between sessions - the next time you open it, in other words). This is how you can customize your speed dial using one of the built-in settings; personally, we prefer 6 columns and 3 rows, which best suits our screen proportions. The next portion of this tutorial explains how to use your own, custom combination of rows and columns. First, open a new tab in Opera, and type "about:config" in the address bar (without the quotes), and hit Enter (or Return on Mac OS X). In the "Quick find" text box, type "speed dial" to filter out irrelevant settings. Scroll down to the very bottom, then select and copy the text inside the "Speed Dial File" text field: this is the location of your speed dial configuration text file. This is all it takes to choose a truly custom number of website thumbnails. The new number of rows and columns in speed dial will show the next time you start Opera! Since you can, in practice, as many new websites to speed dial as you're likely to need or want, you can now have not just a quick access to your email accounts, like adding Hotmail Sign in to the mix, but also all your favorite blogs or news sites right on the first page you see when opening a new tab.